There’re 10 normal routes in Yagodina’s village area. Caves for extreme tourism on the land of the village Yagodina: Yagodinska Cave, Sanchoova hole, Prohodna Krouderenska cave, Hadzhiyska pepa, Gorna Karanska, Dolna Karanska, The Dark hole. More about the caves and routes, you can read in this Microsoft Word DOC document or in the similar document Adobe Acrobat PDF: Routes.pdf. You can also see Haberlea rhodopensis. The caves are one of the centuries old secrets by the nature. She has created within them such beaty, whoever is lucky enough to see it, goes back there again and again. The Yagodina cave is located in the magnificent Buynovsko Gorge, on the right hillside of the Buynovska River. 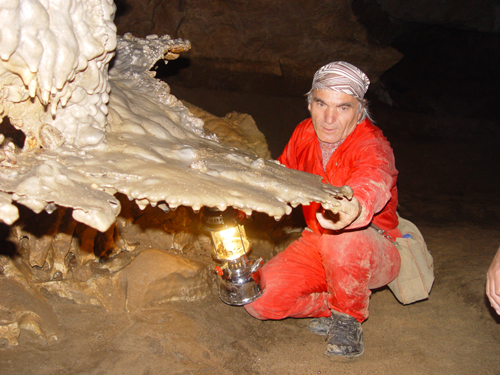 It is the longest Rhodope cave. The total length of the cave is 10.5 km, including a collection of galleries located on different levels. The cave is over 275,000 years old. Only a part of the Yagodinska cave is well-developed and is visited daily, by hundreds of tourists. The remaining none lighten area consists of two extreme routes, which we also offer you to visit. The two routes have different difficulty in overcoming: the first one is a bit more difficult and with more obstacles, than the second one, but so far the practice shows that it is preferred, because of the bigger emotions it give you. On the other hand, the second transition has more cave formations, that fascinates you with their beauty. It’s your choice! Contacts and more information: 0888 519 981 - Todor Todorov. The total length of the route is 5 km and takes about 6 hours. The beginning of this route starts from the natural entrance of the cave - which is a former cave dwelling, that has been turned into a natural museum after archaeological excavations. After looking at the museum, we go out through a low gallery, that is separated from the Antechamber by a metal lattice door. On the right and on the ceiling could be seen small insect-eating bats, which are hanging upside down. The Branch, which consists of three galleries, follows a brief instruction and a narration about the transmission about the tragic events that happened to the people of this region during the fall of Bulgaria under Ottoman rule. The real first part of the extreme route begins, with the overcoming of various obstacles such as diazation, sinking lakes, descents and climbs until you reaches the most serious 30-meter gap. You can overcome it, by the “rope” and alpine equipment and with the help of three specially trained guides, that gives you instructions for safe descent. After so much excitement, you can get some strength, thanks to a cup of aromatic herbal tea. We recommend you to bring yourself a sandwich, because here you can eat and take a rest, while all the people in the group descend, you can even model different pieces of clay. After the inventory is retract, the second part of the route begins, which includes the exploration of galleries with many karst formations: tiger or leopard skin, facets, stalactites, stalagmites, stalactites, cave pearls, blue lakes, limestone bark, our "stone owl", "dog", "crocodile" and our "zoo" of composites; you can see the cave milk. You can take pictures of all these beautiful cave formations. This section is 3.5 km long and what follows up is the exit. 1. Everyone inlove with beauty and strong sensations, should be suitably dressed for low temperatures (6 ° C-10 ° C) and staining with clay. 2. The shoes should be suitable for such conditions and comfortable. 3. Everyone should carry personal lightings - projector, lantern, headlamp. 4. It’is forbidden to smoke and drink alcohol in the cave! 5. It’s forbidden to touch, tear and steal any kind of karst formations! 6.You can carry sandwiches and drinking water. 7.The fee for one person is 30 leva. 9. The group that wants to go along this route should be between 10-15 people. Groups of less than 10 people, will be charged a fee of up to 10 people. 10. We, the organizers, are committed to providing you with a safe and emotionally filled experience, that you will never forget! This route covers part of the third and second floor, as well as a part of the planned route. His total length is 4 km and takes about 4 hours. The route starts from the artificial entrance. As soon as you walk in, you can feel the cool and humid air. The first hall to visit is the straw-like stalactites one. Here, you will hear about the process of their formation. From this hall, you pass into New Year's Eve, where the avid cavers welcome New Year and civil marriages are concluded. In this hall, you can see formations resembling Santa Claus and the Dwarves. The route continues along the "hanging stalaction" and "elephant ears" (draperies). We go through the Big Blockage, the Orbital Hall and the Branch, where the unlit section of the route begins. In this part you can see the "cave milk", our “zoo garden” of the composers and the Phosphere Hall, which is incredibly beautiful (you can get to it by crawling), the "crocodile", a hall with snowy white formations (here, dreams may come true sometimes), a hall with cave pearls. You may also see anomalous stalactites, different forms of stalagmites and stalactites, huge blockages, tiger skin, ponds and calcareous bark. In the Lagera Hall, you will learn the story of the cave exploration. The basics of the gap can be explored by a 10 meter climbing, which vould be posible thanks to the help of two guides and a rope. The next more extreme experience is climbing of the fireplace. From here on, the route continues through the candy-snowflakes, ponds, crystal creek, the "Roman Road" and again, it goes back to the hiking trail, which takes us to the exit. 1. The moisture here is 96-100% and the temperature is 6°C-10°C - you should wear suitable clothes and shoes. 2. Everyone should carry personal lightings - projector, lantern, headlamp. 3. It’is forbidden to smoke and drink alcohol in the cave! 4. It’s forbidden to touch, tear and steal any kind of karst formations! 5. You can carry sandwiches and drinking water. 6. The fee for one person is 25 leva. 7. To proceed on this route, you must submit a request 7-10 days before the day you want to visit on and confirm 3 days before that, on the given phone number. This route is available at any time of the year. 8. The group that wants to go along this route should be between 10-15 people. Groups of less than 10 people, will be charged a fee of up to 10 people. 9. We, the organizers, are committed to providing you with a safe and emotionally filled experience, that you will never forget! Other extreme experiences are also available, such as the "The canyon of waterfalls" eco trail. © 2018 Tourism Association Rodopeya"